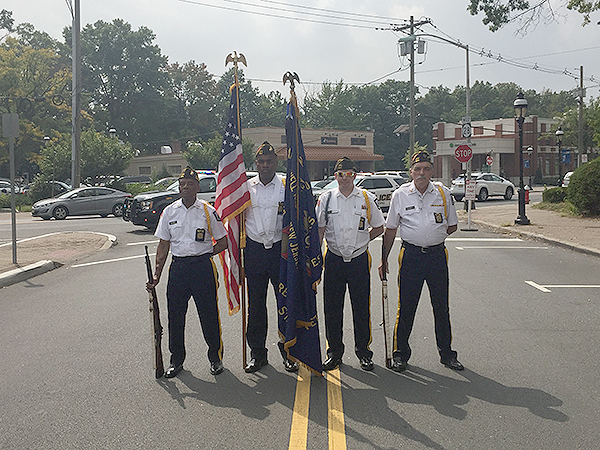 On Saturday, September 16th, Cranford’s VFW Post 335 held its annual flag retirement ceremony, a traditional service to retire a United States flag (Old Glory) when it becomes worn, torn, faded or badly soiled. 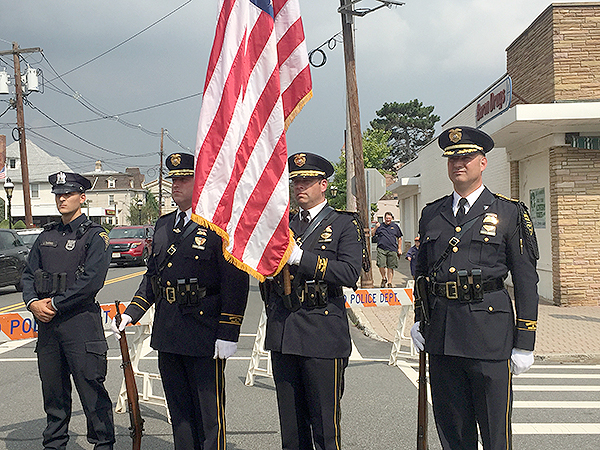 Representatives from VFW Post 335; Girl Scout Troops 40071, 40113, 40534, 40541 and 40706; Boy Scout Troops 75 and 80; the Cranford Police Color Guard and the Cranford Fire Department were all on hand to pay tribute to “Old Glory”. 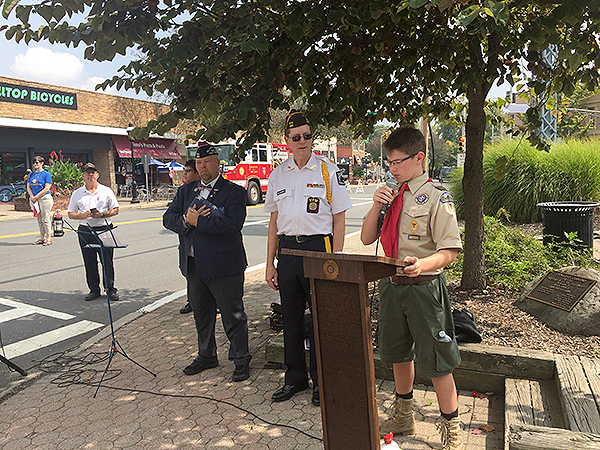 Numerous Veterans and patriotic onlookers attended the ceremony which featured several Cranford Girl and Boy Scouts who spoke of the history and symbols that make up the American flag as well as the traditional folding and ceremonial burning of the flag that takes place in a retirement ceremony. 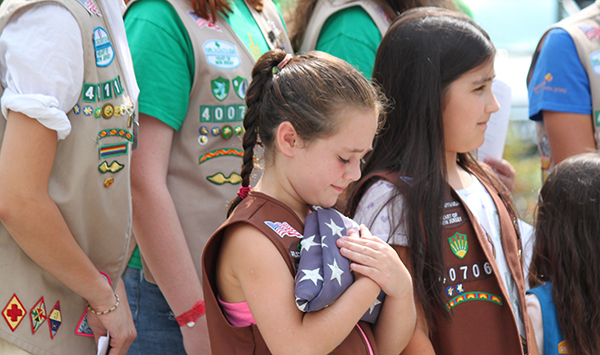 The ceremony ensures that an old flag is “retired” with all the honor, dignity and respect befitting our nation’s flag. A flag should never be torn into pieces and disposed of in the garbage. The traditional method of retirement is to completely incinerate the flag in a hot but modest fire. 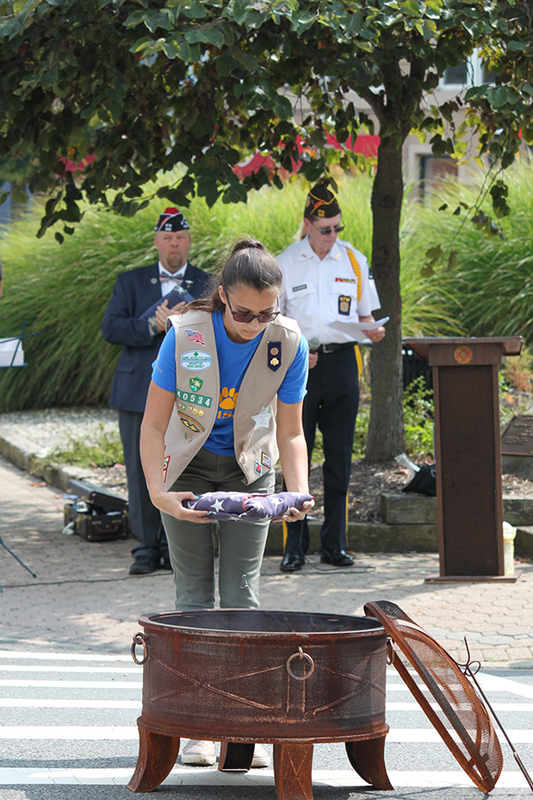 There are only a few organizations authorized to retire flags in this method, but there are many drop-boxes in Cranford where an old flag may be placed for donation to such an organization. Jay Boxwell, Commander of Cranford’s Veterans of Foreign War (VFW) Post 335, was the master of ceremonies. “The tradition of retiring a United States flag spans hundreds of years in history. I’m overwhelmed to see such a great number of our community members, especially our youth, come together to learn the history and traditions of our flag and to show respect for such an iconic symbol of our country,” said Mr. Boxwell. Girl Scouts of Cranford in attendance included Desiree S., Bridget K., Julia R., Ariadne M., Alice M., Sofia M., Juliana M., Victoria D., and Gabriella C. Troop 75 Boy Scouts in attendance included Joshua S., Reid J., Keith B. and Peter H. Troop 80 Boy Scouts in attendance included Logan D., Frank C., Will H., John S., Michael S., Wesley N., and Lucas C.
The Girl Scouts of Cranford boasts over 1,169 Girl Scout Members in 69 troops and Juliette’s making it one of the largest non-profit organizations in town. 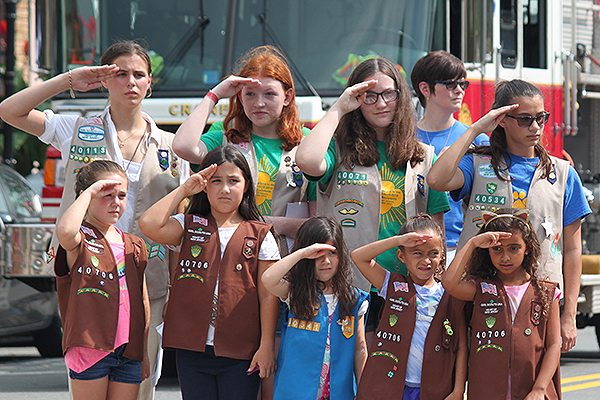 The Cranford Service Unit is a part of the Girl Scouts Heart of New Jersey (GSHNJ) Council which is part of the Girl Scouts of the USA. If your family is interested in learning more about local Girl Scouts or to find out more information on the Girls Scouts of Cranford, please visit http://www.cranfordgirlscouts.com.